Kazak oriental rugs were and still are woven in an area of the Caucasus region which is located at the border of Eastern Europe and Western Asia. The region lies between the Caspian Sea on the east, the Black Sea on the west, Iran to the south, and Russia to the north. It is divided diagonally from the northwest to the southeast by the Caucasus mountain range and is the traditional line of demarcation between the continents of Europe and Asia. The region is one of the most culturally diverse areas of the world and is home to more than 50 ethnic groups. 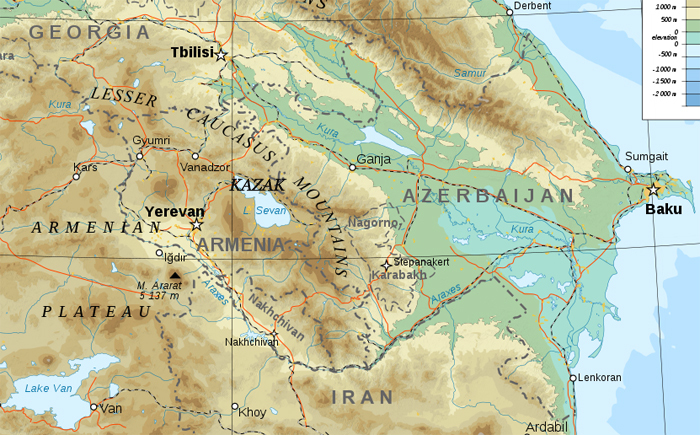 It is occupied by Russia, Georgia, Azerbaijan, and Armenia, as well as portions of Northwestern Iran and Northeastern Turkey. Kazak is a city in what is now the republic of Armenia. 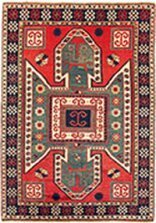 Kazak oriental rugs were originally woven by Armenian weavers (generally the women of the communities) which migrated to the area in the 11th century from Turkey along with Azeri (Azerbaijani) Turk groups. Kazak rugs are not actually associated with any particular tribe, but rather with the geographical areas in which they were woven. Most of what we recognize as Kazak is Armenian. They had a pile that featured coarse, shiny wool with many large medallions in contrasting colors. The weaving history of the area is centuries old. However, it did not really grow until the late 1800s when an organized cottage industry was established by the government. The most important of the Southern Caucasian rugs are the Kazak, Karabagh, Gendje, Moghan, Talish, and Shirvan. Of these, the Karabagh rugs more closely resemble Persian rugs and tend to have finer patterns. The major Northern Caucasian rugs include the Kuba, the Derbend, and the Dagestan. 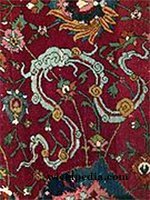 As a general rule, the Southern Caucasian rugs (Kazak and others) were coarsely knotted with medium to long pile and featured large medallion motifs in their fields. The Northern Caucasian rugs (Kuba and others) had densely packed short pile woven with finely spun yarns and adorned with all over motifs in their fields. The early Kazak oriental rugs were a sign of status for their owners. It was not unusual to find them woven with strands of silver and gold and located on floors and walls in churches and palatial homes, and even in palaces on the throne of a king or at his feet. 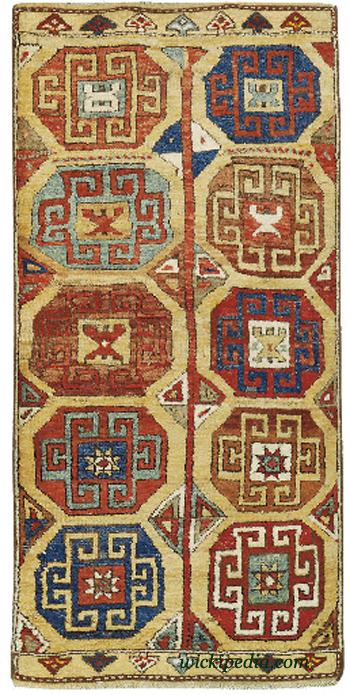 The Kazak rugs of the 18th and 19th centuries were produced by both Muslim and Christian communities. A large number of those produced by Christian weavers contained dates in Roman numerals. 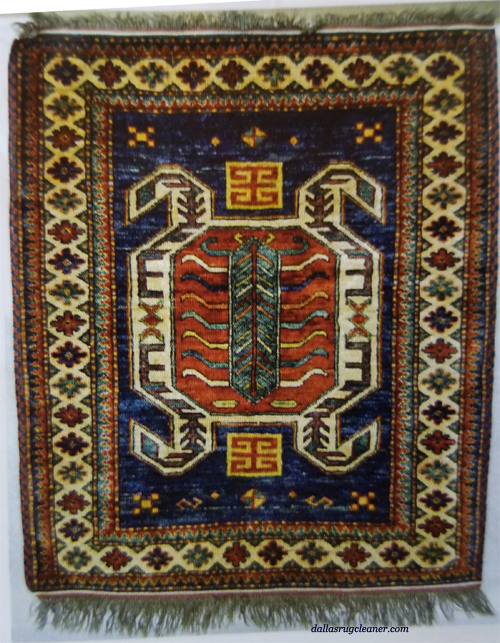 Antique Kazak rugs made in the 19th century are very collectible and expensive. There are several sub-groups of these Kazaks including the Karachoph, Fachralo, Bordjalu, and Sewan Kazaks. The antique Karachoph Kazak rugs tend to be among the most valuable. They consistently featured green fields. One design featured a large, central medallion with a row or two of smaller medallions in the field at each end of the medallion. 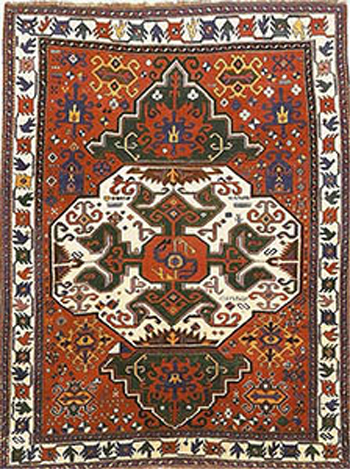 Fachralo Kazak rugs are another sub-group of Kazak rugs and usually featured a medallion and a Mihrab or prayer niche, suggesting they were woven as prayer rugs. The fields can include the colors of sky blue, green, and red. They tend to be almost square such as 4'x5', though large ones can be found. They have a thick pile, high quality wool, and natural dyes. The Fachralo type of Kazak tend to have quite a bit of open space between motifs. Bordjalou rugs have simple designs and are coarsely woven. The colors are typically a combination of blue, red, natural brown, and ivory. Sewan Kazak rugs have bold 'shield medallion' designs with scattered tribal plants growing on the background of a main red field. 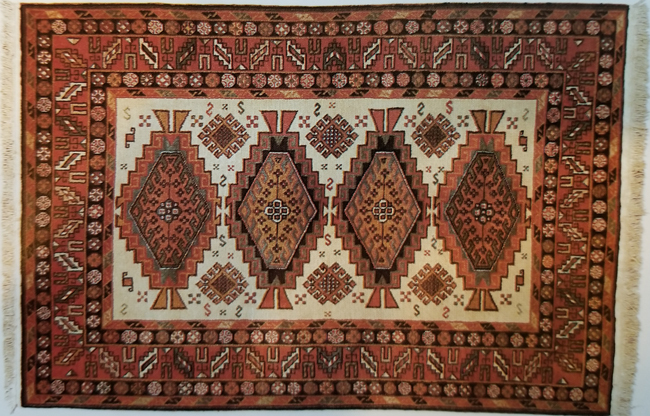 Another type of Kazak rug was the Lori Pambak Kazak which was produced in the Southeast Caucasus region of Southern Russia. They were finely woven and had a more closely cropped pile than some of the others. The fields were typically red and had a large medallion that can be ivory and contain stylized tulip motifs. The Lori Pambak were produced in the 5'5 wide and 8'8 long sizes. Antique Kazak oriental rugs were almost all thick and fluffy. They were more coarsely woven than the Shirvan, Kuba, and Dagestan rugs from the Northeast Caucasus. 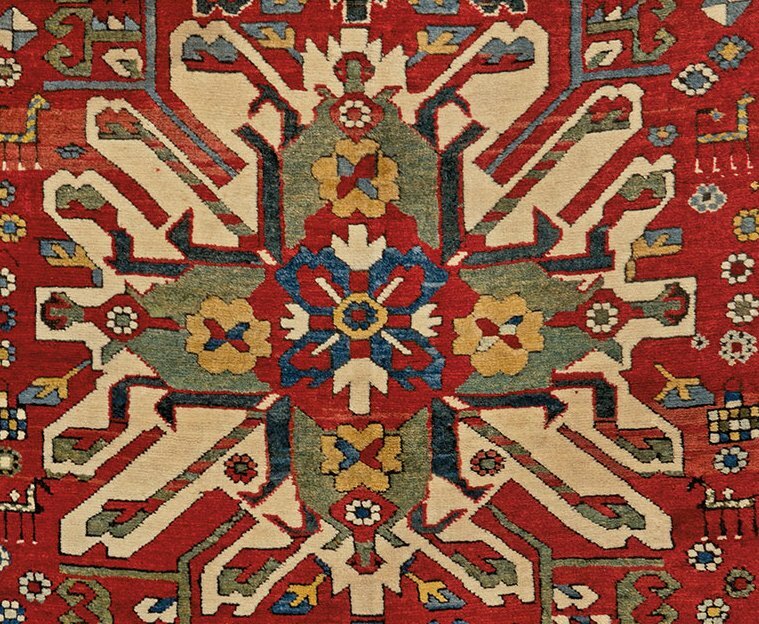 Kazak rugs made in the early 20th century began to add synthetic pinks and other colors. They also tend to have multiple red wool wefts (side to side cords). 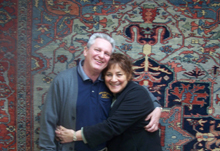 Many of the other types of Caucasian rugs use beige or brown wefts. Surprisingly, two of the most famous types of Kazak rugs, the Eagle or Sunburst Kazaks, and the Cloudband Kazaks are not truly Kazak rugs but were woven in the Karabagh region of the Caucasus. The Eagle or Sunburst motif may have come from St. Joseph's Cross alluding to the Christian religion of the Armenian weavers. The warps (up and down cords) were originally wool, although rugs produced today can be cotton or a wool/cotton combination. The cords are an undyed natural color, usually 3 ply, (though some can be 2 ply) with strands of different shades. The wefts (side to side cords) can have 2 to 6 strands of 2 ply natural or dyed wool (or cotton today). The strands are usually red but sometimes yellow or blue in later rugs. 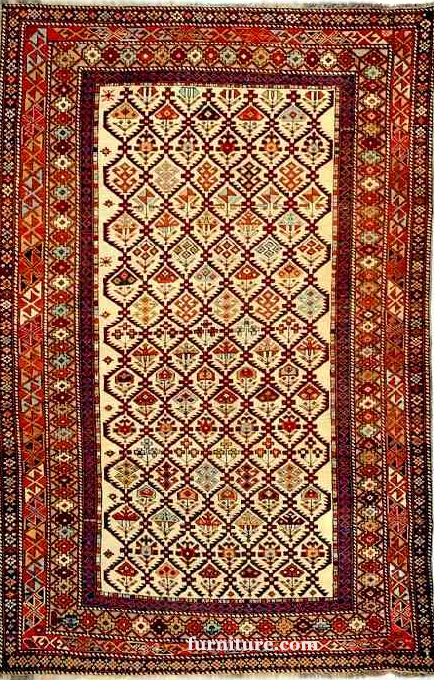 Karabagh rugs from the Southern Caucasian area are similar to the Kazaks but tend to have fewer wefts (usually 2) and the wefts are undyed. The knot is the Turkish or Giordes symmetrical knot. The sides typically consist of 2 or more warp cords overcast in wool, often using pile colors or a single cord weft wrap in cotton or overcast in blue wool. 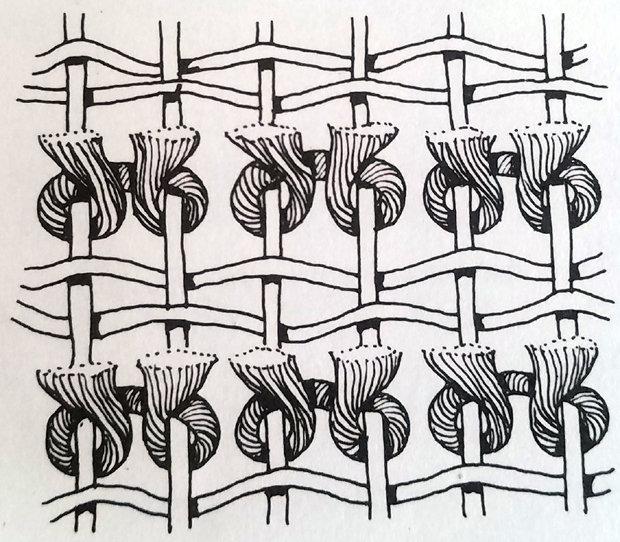 The upper ends often will have a plain weave with fringe. The lower can have loops or a half-hitch end finish. There could also be shaggy fringes on both ends. Some use the fringe only at one end and finish off the other end by turning back the warps and hemming a few inches. The Kazaks used dense dyes and bright colors such as red, blue, green, and ivory. They were usually not larger than 5x8. 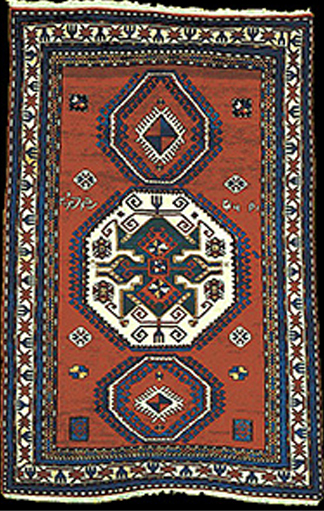 The Kazak design features large, bold geometric patterns on a typically open field. There is a definite folk influence evident in the design of Kazaks with scattered geometric figures which can include detached shapes such as medallions, squares, diamonds, circles, and crosses, any of which can incorporate humans, animals, birds, trees, and floral motifs. Rosettes and polygons abound also. A type of motif called a Membling Gul is common. It is a medallion which can be octagonal or lozenge (rhombus) shaped. These motifs usually have either twofold rotational symmetry (appears the same when rotated by one-half of a full turn about its center, making its appearance identical in 2 distinct orientations or they can have mirror reflection symmetry (left/right or up/down) where the 2 halves are each other's mirror images. The borders of Kazak oriental rugs are heavily patterned as well, as is common in many Caucasian textiles. Originally, the foundation (warps and wefts) were wool. Natural dyes were used and the colors and patterns were clear and strong. Since 1925, the warp is made of cotton, synthetic dyes are used, and the colors and the patterns have become simplified. The wool used today for the pile is tightly hand-spun using a drop spindle. This makes a dense, though flat and thin rug and gives it a soft and aged look. 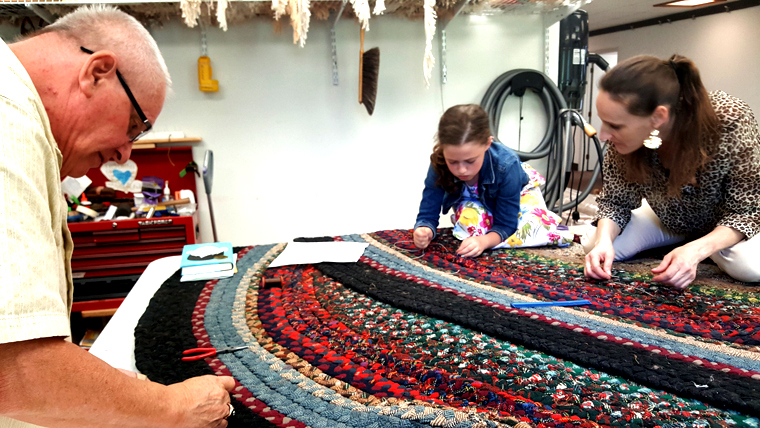 The rugs typically go through a stone-washing process as well resulting in an abrash effect, which gives the pile an antique or aged finish. Those rugs still made in the Caucasus region are generally not larger than 5x8 feet. Newer rugs are produced in Pakistan today and the weavers use the Caucasian rugs as their inspiration. Natural plant dyes are used as well. These rugs have a relatively short pile and are quite durable. Although exported by Pakistan, the rugs are usually woven by Afghan refugee weavers who escaped from the Taliban regime in the 80s and 90s. The Afghan Hazara weavers are producing Kazak rugs as a modern version of traditional Caucasian rugs and they are known for their reds, indigo blues, and ivories. They are typically finer than the rugs they are copying. Copies of the classic Kazak design are also now being woven in Turkey and Romania. The Turkish Kazaks incorporate more muted colors, especially the reds. 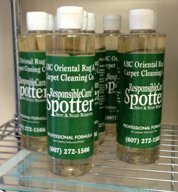 Did you know that our ABC Responsible Care Spotter can get those pesky spots out of your carpet and rugs and will work equally as well on your clothes and upholstery? Stop by our office and pick one up. They are $5.00 + Tax but if you have carpets or upholstery cleaned in your home or business, just request a free one from your Technician. And don't forget to fill out the form above to download your free ABC Spotting Guide!